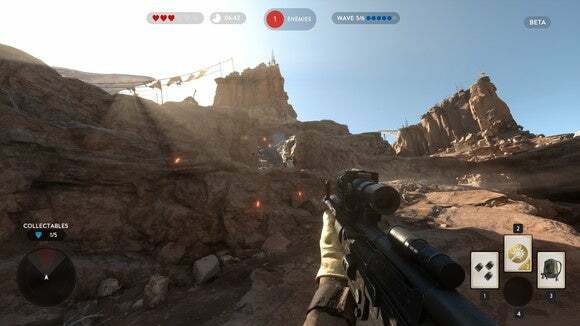 Star Wars Battlefront is a scant month away from release, which means it’s time for everyone’s favorite DICE tradition: The “beta test” that’s part server stress-test and part HYPE. BUILDING. MACHINE. The beta opens to everyone on Thursday, but I got the chance to play a bit early and I think I like the game better than I did at E3. But it’s still no Battlefront 3. First, let me get my major complaint out of the way: The guns. Weapons are usually DICE’s forte, both in terms of how they handle and how they sound. Battlefront‘s guns, by contrast, feel lackluster for three reasons. 1) The pew-pew of laser weapons is weak-sounding in comparison to DICE’s previous work. 2) There’s no recoil. 3) Instead of recoil, guns now have a fairly large spread at long-range. You know the joke about Stormtroopers firing a million rounds and none of them hit the target? I’ve felt that way more than a few times during the beta. Recoil is great because it’s something you can, with practice, accommodate for. It’s skill-based. You get better at holding the muzzle down. 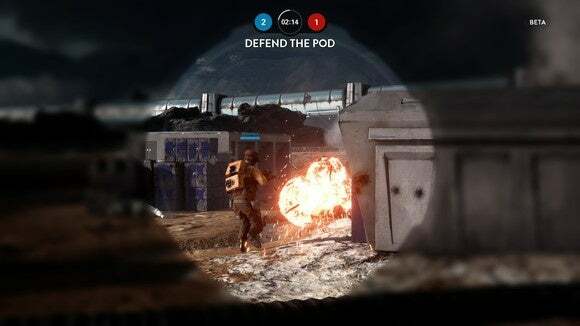 Battlefront’s weapons feel more luck-based. You’re mostly hoping the gun’s spread stays small enough temporarily for you to get the kill-shot in. Anyway, that’s my biggest issue with Battlefront so far. The beta is comprised of three modes—two multiplayer, one singleplayer/co-op. “Drop Zone,” a sixteen-player mode, is the best of the bunch. It’s sort of a more dynamic version of Battlefield’s Rush mode combined with King of the Hill, maybe? Two teams struggle to capture Escape Pods, which rain down from the sky periodically and land semi-randomly around the map. Secure the area long enough and your team scores, plus special power-ups—orbital strikes, proximity mines, et cetera—pop out as a reward. It’s just a really fun mode. The random nature of Escape Pod drops leads to a pretty satisfying back-and-forth, with teams constantly shifting between offense and defense. And like Rush, it forces players towards an objective and mitigates the “I’ve run for five minutes and haven’t seen anybody” problem you occasionally find in more freeform game types. Best of all is when multiple Escape Pods land at the same time—something I’ve seen happen twice so far. It’s rare, but it forces teams to quickly decide whether they risk it and go for both or play it safe and cede one to the enemy. I’d actually like to see those occurrences happen more frequently, as it’s an interesting tactical scenario. On the other hand, Drop Zone isn’t very Battlefront-y. No vehicles, no heroes. Nothing but grunts with assault rifles. 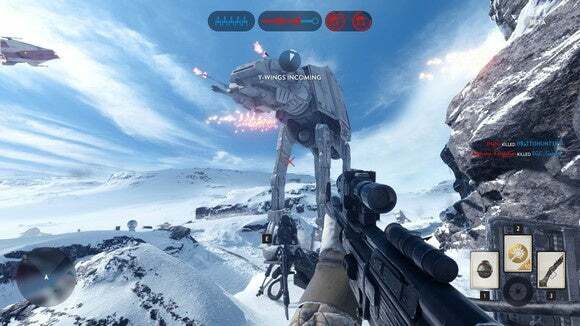 For that classic Battlefront feel, you need to play the other multiplayer mode: Walker Assault, a.k.a. what I saw back at E3. This one...ugh. 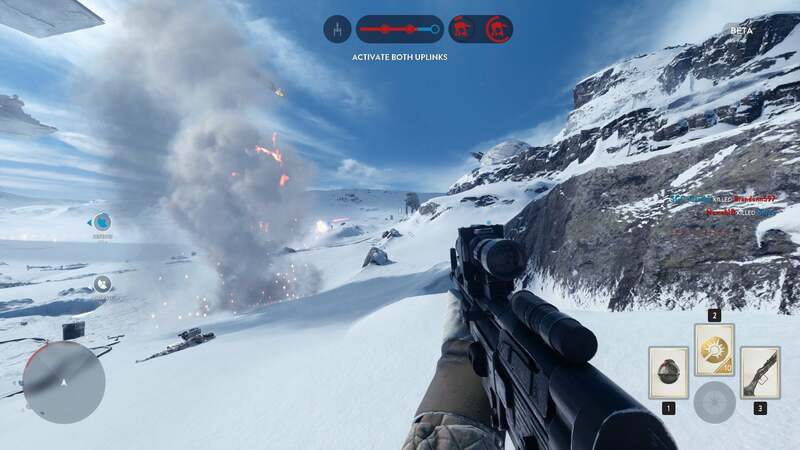 It’s the “big” mode in the Battlefront beta, topping out at 40 players. Plus it’s got AT-ATs! And AT-Sts! And A-Wings! And Y-Wings! Okay, so that last one is completely AI-controlled, and the AT-ATs just walk in a straight line the whole time. But uh...they exist. And you can become Luke Skywalker/Darth Vader if you’re the lucky person who snatches the corresponding power-up. It’s just not a very interesting game mode. It lacks the dynamism that makes the Battle of Hoth such a classic set-piece, and it lacks the player count and the player agency that made Battlefield 2142’s Titan Mode feel epic and chaotic. The map’s too massive and too empty, the film’s struggle between A-Wings and AT-ATs practically nonexistent, and an Imperial team can win with one lightsaber tied behind its back at the moment because no Rebel team seems to know what the hell they’re supposed to be doing. Of those complaints, only the last one has any chance of improving once the game releases. And we barely need to touch on the singleplayer/co-op Survival mode included here. It’s a repurposed Horde mode. That’s it. Nothing particularly clever about it—just fight off waves of enemies. If you want to do that in a Star Wars setting, cool, but I didn’t stick around long. Though in the beta it’s the only way you’ll get to see the Tatooine map. It’s worth seeing. 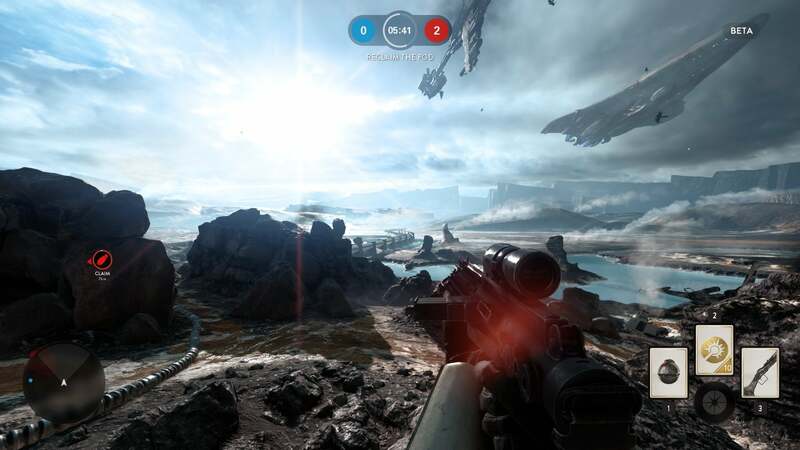 All three maps—Hoth, Sullust, and Tatooine—are gorgeous. I knew that the game looked pretty coming out of E3, but seeing the game running at Ultra on a PC? It’s sharp. This is a game ripe for screenshots, with massive space battles taking place miles overhead and the classic red lasers pew-pewing past your head. On a 980 Ti I’m able to crank Ultra, 1920x1080 at 100 to 110 frames per second, which is stunning. I’ve had a few hitches so far, but it’s hard to tell what’s server-side and what’s not. Also, one hard crash-to-desktop, because it wouldn’t be a Battlefieldfront beta without some issues. We’ll see how the game holds up come Thursday when it opens to everyone. I’m loving Drop Zone, I’m dreading Walker Assault, and I’m bored with Survival. Still, one out of three isn’t bad for a beta, and I’m definitely looking forward to Battlefront more now than I was after E3. As always, we’ll have a more thorough review when the game releases next month. There are about a half-dozen more modes and nine maps sealed off from the beta, so there’s plenty left to explore. Plus there’s always the chance for a Battlefield 4-style meltdown at launch. We’ll keep you posted.